The SyFy series, which portrays a post-apocalyptic world filled with zombies, features Native actors protecting their homelands in an episode entitled, “We Were Nowhere Near the Grand Canyon”. 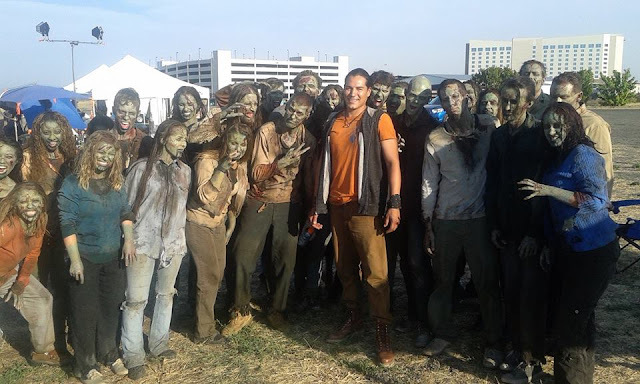 Eddie Spears as Gorden Firecloud aka Red Hawk: Gorden Firecloud aka Red Hawk is the leader of part of a Native American tribe that followed him to their ancestral land to survive the zombie outbreak, in the hopes that their ancestors would protect them. The son of Chief Dan Firecloud and brother of Ayalla Firecloud, he appeared in the 10th episode of season 2, "We Were Nowhere Near the Grand Canyon". Before the apocalypse, he was a college professor specializing in native culture. His tribe is wary of the zombie virus infecting their community, calling it "Zendigo" and a "disease of the soul", and Red Hawk blames the outbreak on whites. "We Were Nowhere Near the Grand Canyon" is the tenth episode of Season 2 of Z Nation and the twenty-third episode of the series overall. Native actors: Eddie Spears, Gene Tagaban, Tonantzin Carmelo, Tinsel Korey and Jeff Barehand. Responses to "Native tribe kills zombie outsiders at Grand Canyon in Z Nation TV Series"